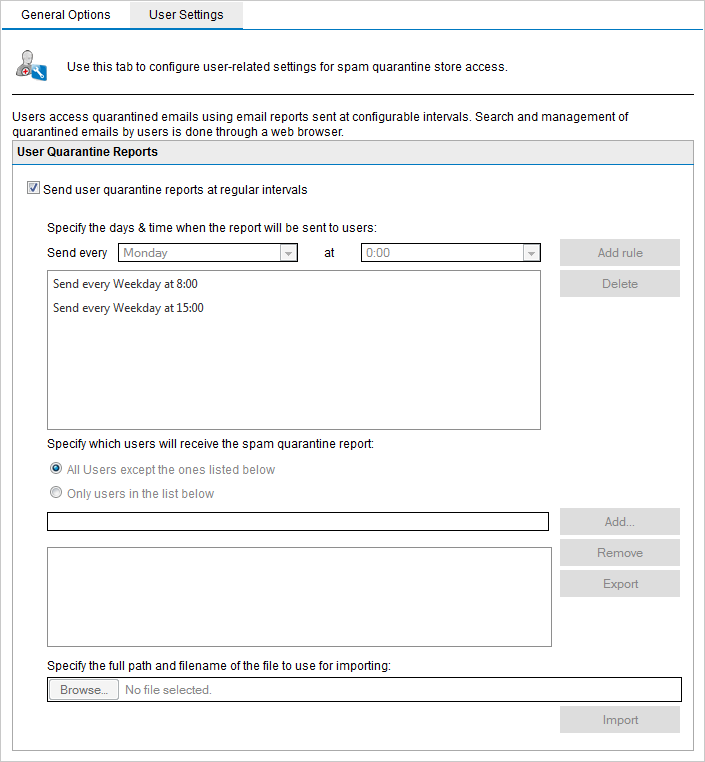 Use the QuarantineA email database where emails detected as spam and/or malware are stored in a controlled enviornment. Quarantined emails are not a threat to the network enviorment. Options to configure spam retention, user quarantine reports, quarantined malware and emails sent to inexitent users. Navigate to Quarantine > Quarantine Options > Spam Options. From the General Options tab change or confirm the Spam quarantine store email retention period. Select Send user quarantine reports at regular intervals to enable sending of User quarantine reports. User quarantine reports are emails sent to users on a regular basis with a list of blocked spam for that user. Using this list, users can check and approve any legitimate emails. Email blocked by the MalwareAll malicious types of software that are designed to compromise computer security and which usually spread through malicious methods. and Content Filtering filters are not shown in these emails. Configure the frequency at which report will be sent. To add to the preset schedule, select a date and time and click Add rule. Select an existing date and time and click Delete to delete selected date/time. Configure the users that will receive the Quarantined Spam reports. Select All Users except the ones listed below or Only users in the list below and provide the email address of the users to include or exclude. Click Browse to select a file with a list of email addresses to import and click Import. 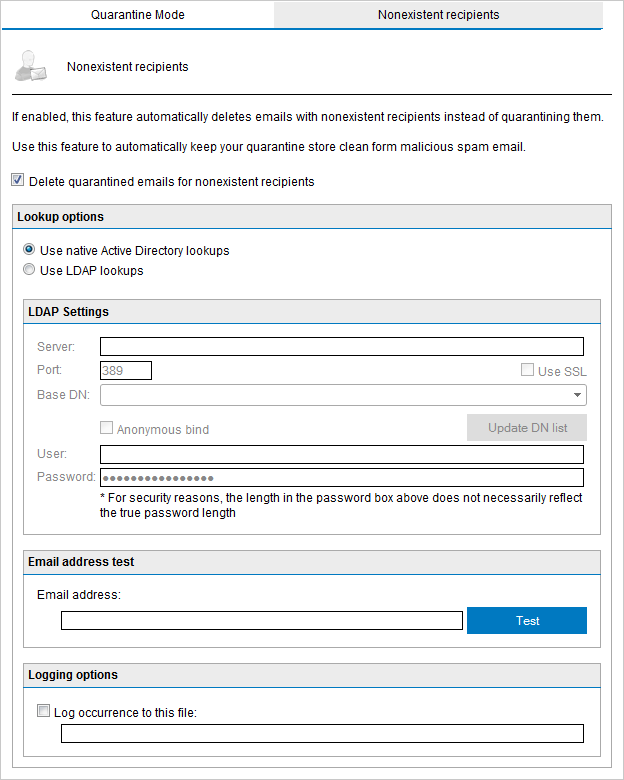 GFI MailEssentials can also be configured to notify the administrator or authorized users via email (Quarantine Action Form) whenever an email is quarantined. The Quarantine Approval Form contains details related to the quarantined email including the reason why it was blocked and any attachments that were included in the email. The administrator can then action the quarantined email (for example, approve the email) directly from the email client. To automatically purge emails older than a specific number of days, create a new search folder and set the Auto-purging feature to purge emails after a number of days. For more information refer to Using the Search Folders node to auto-purge quarantined emails . Navigate to Quarantine > Quarantine Options > Malware Options. 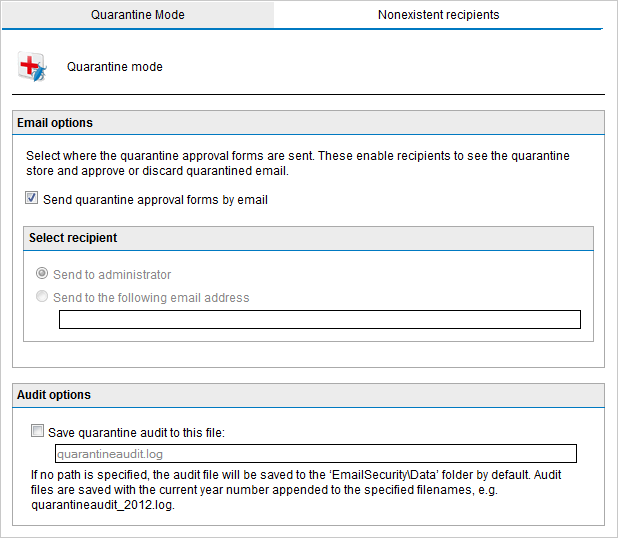 From Quarantine Mode tab, select Send quarantine approval forms by email checkbox to enable the sending of Quarantine Approval Forms. Sends Quarantine Approval Forms to the administrator as configured in General Settings node. For more information refer to Administrator email address. Send to the following email address Sends Quarantine Approval Forms to another email address. Key in the recipient in the text box provided. Optional - Select Save quarantine audit to this file and configure a filename where to save a copy of the quarantine log. The GFI MailEssentials Nonexistant recipients feature scans emails for non-existing local email addresses before these are stored to the Quarantine StoreA central repository within GFI MailEssentials where all blocked emails are retained until they are reviewed by an administrator.. If an email contains non-existing local email addresses, it is permanently deleted. This reduces the number of emails for administrative reviewing. The Nonexistent Recipients filter requires access to the list of local addresses. This is done either via Active DirectoryA technology that provides a variety of network services, including LDAP directory services. or if communication with Active Directory is not possible, via an LDAPLightweight Directory Access Protocol server. From Nonexistent Recipients tab, select Delete quarantined emails for nonexistent recipients checkbox. Select this option if GFI MailEssentials is installed in Active Directory mode and has access to ALL users on Active Directory. Skip to step 8. When GFI MailEssentials is installed in Active Directory user mode on a DMZDemilitarized Zone, the ADActive Directory of a DMZ usually does not include all the network users (email recipients). In this case configure GFI MailEssentials to use LDAP lookups. WhenGFI MailEssentials is behind a firewall, this feature might not be able to connect directly to the internal Active Directory because of Firewall settings. Use LDAP lookups to connect to the internal Active Directory of your network and ensure to enable default port 389 on your Firewall. Use LDAP lookups Select this option when GFI MailEssentials is installed in SMTPSimple Mail Transport Protocol mode and/or when GFI MailEssentials does not have direct access to the full list of users. Specify the LDAP server name or IP address in the Server text box. In an Active Directory environment, the LDAP server is typically the Domain Controller or Global Catalog. Specify the port number, default 389, in the Port text box. If connection to the LDAP server is via SSLSecure Sockets Layer, select Use SSL and the default port changes to 636. Ensure that the port is enabled from the Firewall. Click Update DN list to populate the Base DN list and select the Base DN (that is, the top level in the Active Directory hierarchy). If your LDAP server requires authentication specify the User and Password. Alternatively, if no authentication is required, select Anonymous bind. Test your configuration settings by specifying a valid email address in the Email address box and click Test. If the email address is not found, review the configuration settings.